Pssssst………guess what????? Guess who I am working with again???? I was so ecstatic to find out that I was one of the lucky chosen bloggers to work with Land O Lakes® and their new product!! Let me introduce to you a seasoned butter & olive oil saute starter called, Sauté Express® Sauté Starter!!!! I can’t think of an easier way to make a good, healthy, hearty, quick, weeknight meal. YES all of those things in a beautifully wrapped little square my friends. How you ask? 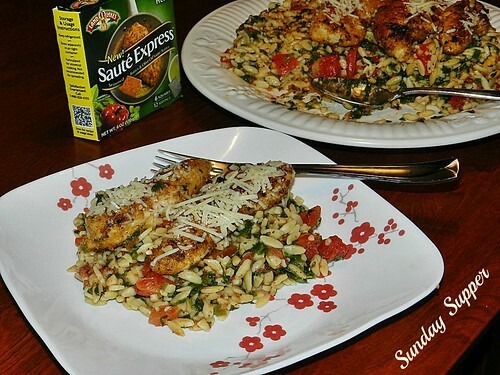 Visit your local store that sells Land O Lakes® Saute Express, choose one of these awesome recipes that my fellow #SundaySupper bloggers have come up with, whip out your favorite saute pan…………and wala! Dinner is ready on a busy night! You have to take my word for it, you trust me right? I’ve used Land O Lakes® products before and I’ve never been disappointed. Remember my awesome Glazed Chicken w/Butter and Pecan Rice? Yup that was Land O Lakes® product too!! Once I was introduced to Sauté Express® Sauté Starter I looked and looked for a recipe, it took me a whole day of glancing through their website, other people’s ideas, I really wanted to try something of my own and I already had a rough idea of what I wanted, I just couldn’t piece it together, I really never “made it” happen until I actually cooked it and then proceeded to eat almost the whole dish. Hey I’m eating for two remember! I’m so glad that I just went with my thoughts on this dish because it was awesome! So flavorful, I already started selling it to my sister the next day when she had some for lunch. She’s a single gal, doesn’t love cooking like I do, likes to cook healthy but quickly. I think I have her sold! I know, I know, enough talking, let’s get down to the details! Make Orzo ahead of time to save on cooking time. Make on a Sunday and pop it in the fridge until your ready to cook the rest of this delicious dinner on a busy week night. You also do not have to bread the chicken, I made it both ways and the flavor of this product makes both ways perfect! It eliminates steps and makes it a bit healthier if you just saute the chicken rather than bread it first. I now have realized that the true “Chicken Parm bread feeling” did not have to be done. In order to make this dish even quicker, get everything out and ready to go, it happens so fast every thing will be right their by your saute pan. Take your frozen spinach out of the freezer that morning to let it thaw out, open it and get it ready to throw together! If the Orzo has not been previously made, make according to package directions and set aside. I did this ahead of time and had it by the stove ready to go. In a small bowl add the egg whites. In another small bowl add the breadcrumbs. Dip each piece of chicken (whether it be the tenders or the cutlets) into the egg whites and then dip it into the bowl of breadcrumbs and coat well. Repeat with all of chicken. Place the chicken on a serving dish and cover it with a piece of tinfoil. Add the last block and a half of the Italian Sauté Express® Sauté Starter. Once it’s almost melted add in the cooked orzo, spinach and diced tomatoes. Mix well until everything is incorporated together. Add chicken to the top of the Orzo Pasta and transfer back to the serving dish. Sprinkle with cheese. Wala. Dinner is served! 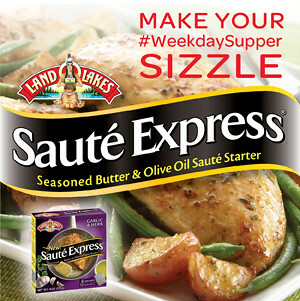 Go check out Land O Lakes® and the rest of their Sauté Express® Sauté Starters and buy them ASAP!!! Now onto the rest of #SundaySupper recipes, remember their are four different flavors!!! Land O Lakes® wouldn’t be Land O Lakes® without a Giveaway!! 1. The giveaway is for a coupon for one free package of Land O Lakes Saute Express. 3. One requirement to win is to comment on my post about this product/recipe. 4. Like Momma’s Meals on Facebook. 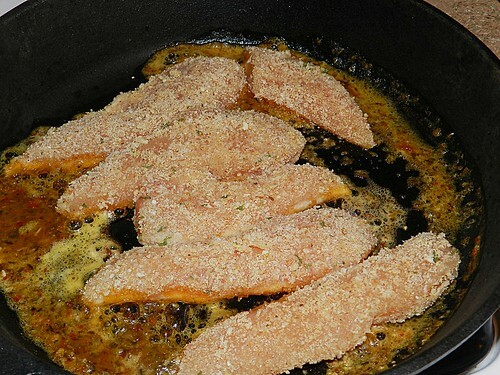 I love the idea of cooking the tenders in the sauce, great way to add a lot of flavor without a lot of work! What a great way to speak veggies into kids meals… this recipe looks amazing! I haven’t had chicken parm in ages. Yours looks so colorful and delish! I like the ease of it and how it is served over orzo. This is one of my FAVORITE meals to make! I can’t wait to try it with the Saute Express! Tammi, this looks so good! I love that you used orzo. Yum! This looks great and simple to make. Thanks for sharing! Very nice…I’m sure the Saute Express gave the tenders fabulous flavor!! I can’t wait to try this. I would like to try the garlic and herb first. I can’t wait to try this one Cindy! Thanks for stopping by!! You know what? This dish IS getting made this week…I have come back to look at it like 3 or 4 times this morning – I need it! You won’t be disappointed, the Saute’ Express really made it (thought I’ll take credit for the rest) teeheee….. This dish looks amazing! 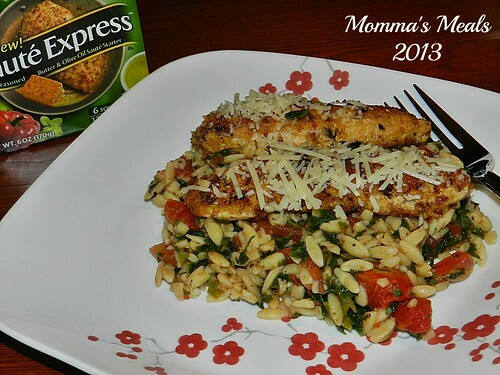 Love the idea of a chicken parmesan in smaller portions and serving it with orzo is perfect! What a yummy combo! 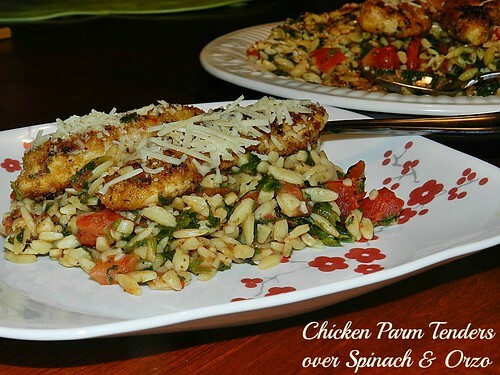 I love the spinach and tomatoes mixed in with the orzo…a perfect pair for the tenders! Yum! I wouldn’t definitely keep the breading! Sounds awesome! Mmmm, I LOVE orzo dishes, and this looks YUMMY! ooooh chicken parm! Love it! I need these! Those tenders look so delish! Great recipe! 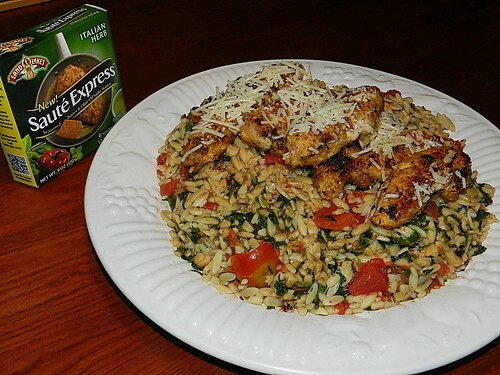 I’m thinking that Saute Express would taste very good with some breaded chicken, great dish! I love Chicken Parm ~ never would have thought to make it with the Saute Express!! Great idea!!! Chicken Parm is my husband’s favorite! I will def be giving this recipe a try! It’s been WAY too long since I’ve made chicken Parm…and I just picked up the Italian Herb Saute Express today. It must mean I have to make this one! YUM! It all sounds delicious! Would love to try the Garlic & Herb. Everything is better with Garlic!